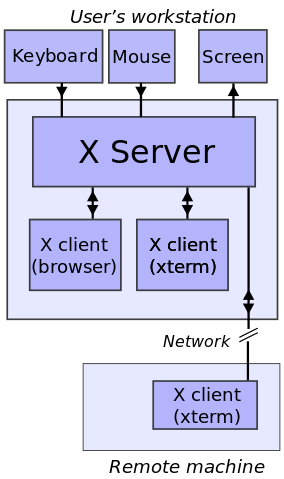 X is a program that sits on a Linux machine with a monitor (so servers usually don’t use X). X’s job is to talk to the Linux kernel in behalf of GUI programs. So if you are playing a game for example, the game (that is, the application) is constantly sending drawing commands to the X server like “draw me a rectangle here”. X forwards all this to the Kernel which will further forward the information to the GPU to render it on the monitor. X can even receive commands from the keyboard or mouse. When you click to shoot on your game for example, the command “click at 466,333” is sent from your mouse to the kernel, from the kernel to the X and from X to the game. That way the game can have a clue on what is happening! I get :0, which means we use display 0. Notice however that this says nothing about which monitor we use. This makes sense since if you are running 2 or more monitors on your Linux you still have the same environment variables in both of them. It wouldn’t make sense that an environment variable changes just because you echo it from a different screen, would it? For that reason we get the display and not the monitor so that we get the same output on both. As about the hostname, since there is no info about it, the local host is assumed. Instead of running X, we can run a different version of it that can create virtual displays. Xvfb (virtual framebuffer – whatever the hell that means) will create a virtual monitor for us. We see we have the normal display 0. (A way to tell it is the default screen is to see that it runs as root.) We can also see the second display :1 and screen 0 with resolution 1024×768. So what if we want to use it? So now we are sure that we are running the virtual screen. Let’s access it and run something graphical on it. In this case I will run Firefox and Python+Selenium just as a proof of concept of what is happening. Xlib:  extension "RANDR" missing on display ":99.0". The errors don’t mean anything. But we can’t be sure, can we? I mean, since we can’t see what’s happening it’s really hard to tell. There are two things we can do, either use ImageMagick to take a snapshot and send it to our host via a socket or we can simply use Selenium. I will do that since most people probably want to achieve all this for testing purposes anyway. If you try and run Chrome in a Docker container, it won’t work even if you have setup everything correctly. The reason is that Chrome uses something called sandboxing. Reading this I could not let but notice the word jail. Apparently it seems that Chrome uses Linux containers (the same that Docker uses). For this reason you have to put a bit of extra effort to solve this issue since because of technical difficulties it’s not possible to run containers in containers. The second solution is probably the best one. However while testing things, there’s nothing wrong with the first one. It seems that it works. It’s normal that we get the gpu errors since we don’t have a gpu! However I don’t like gambling so we will take it a step further to check that the browser actually works. However for this I will need to download the webdriver for Google Chrome.. Categories: Linux Kernel, Python, Terminal, Uncategorized, Web | Tags: Chrome, chromedriver, container, DISPLAY, Docker, Firefox, Python, Selenium, virtual monitor, virtual screen, Webdriver, Xorg | Permalink.